The garage mechanic/roof tiler/drain unblocker/washing machine fixer/brain surgeon/lawyer/dentist are all descendants of the same gene. You have arranged to see them and you guess you’re just another Joe with a worn ball valve solenoid collapsed pipe spring widget divorce synapse enamel issue. They will have seen it all before. You are boring! And yet every time you encounter such people there is a huge intake of breath accompanied by a shaking of the head. Eventually those fateful words emerge ” Oh dear – dear Oh dear – this isn’t the normal sort of thing – dear me- this is more serious than I thought. Don’t know what we can do about this – dear oh dear- who fitted this brain/pipe/marriage/ widget sprocket/tooth? Does this sort of thing happen to you? Perhaps I just leave things too long. So, I arrived in England on the overnight ferry. Sat naff sat with me all the way giving me impeccable instructions in French. 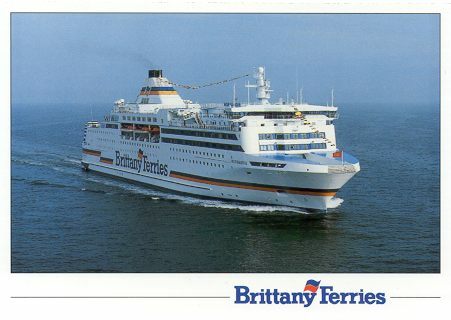 My wonderful 1997 Mercedes 250 diesel shrugged off her 264,000 mile history and delivered me to Brittany ferries. I slept and awoke to the gourmet breakfast of smoked salmon, boiled egg, ham and cheese. There is also a choice of all manner of juices and fibres for people who have body temples. I don’t do commercial plugs, but Brittany Ferries posh restaurant breakfast buffets are WONDERFUL. So I drove to Rosina’s place, had coffee and set off for the dentist at the little market town of Romsey. I emerged an hour later a new woman. Dear me – I was a big job. I was pinned and shuttered like concrete gate post by a most meticulous guy called Dr Thomas and his lovely assistant Julie. If you’re in the area and need a tooth job – these are the guys. Then the desk. I collected it from my old house. England no longer seems like home but sometimes neither does France. Tomorrow is the 14th Juillet – the national day with fireworks and well – fireworks. It is a celebration of the storming of La Bastille (a Paris prison) in 1789. I could join in of course but somehow I’m kinda glad to leave it to those born to it. Elgar’s Nimrod from his Enigma Variations, the peel of church bells and the bark of a dog across the meadows this evening are my home. Sometimes I think of all those frontier guys who set out to make the USA and could never come home or know again those subtle rhythms and aromas of their own place. As I have said before, everything that we are and that we have was paid for by some poor soul. Emma thinx: Home is where the artful are. This entry was posted in Brittany Ferries, Cars, Emma Calin, Food, Philosophy, Social Comment, Test Valley by emmacalin. Bookmark the permalink.